Preventing Birds from Flying into Home Windows - Zona Fountains, Inc.
Bird watchers who wish to prevent birds from flying into their windows now have options right here at Zona Fountains. Millions of birds become injured and/or die each year from window collisions. 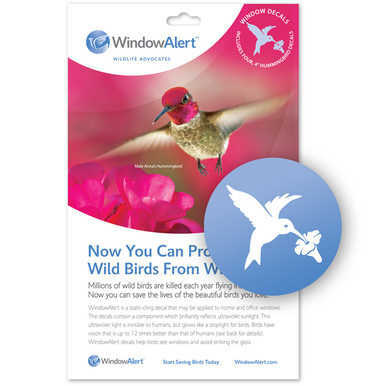 We all look for ways to prevent that dreaded ‘thud’ — and we are now carrying WindowAlert® Window Decals to assist Southern Arizona’s many bird lovers! 1. Apply window decals specifically designed to prevent bird run-ins. 2. If you have the space, move bird-attracting items (e.g., feeders, birdbaths, fountains) away from the windows and house. 3. If space is limited, move bird-attracting items (e.g., feeders, birdbaths, fountains) closer to the windows and house. 4. Apply a screen, net or awning to the windows. Take a look at our newest feeders, birdbaths, and fountains to attract more friendly fliers to your neighborhood! This entry was posted in Zona Fountains News and tagged Alex Hinrichsen, ARHINRICHSEN, bird lovers, birds, collisions, home and garden, new item, outdoor, ultraviolet, uv decals, Window Alert, window decals, windows, Zona, zone fountains. Bookmark the permalink.